It is BBQ season my baes. (I just Urban Dictionaried that word and turns out it is also a Danish word for poo. Who knew?) I think if you were to ask anyone what foods are the most BBQ-y they would say burgers then probably potato salad. Truth. I have never been a huge fan of potato salad mostly because if my mom put mayo in anything should would have to hide it and there is generally no hiding the mayo in poatao salad. That is why I haven’t adapted her Spinach Artichoke Dip yet because I am so put off by how much mayo is in it. Also re. 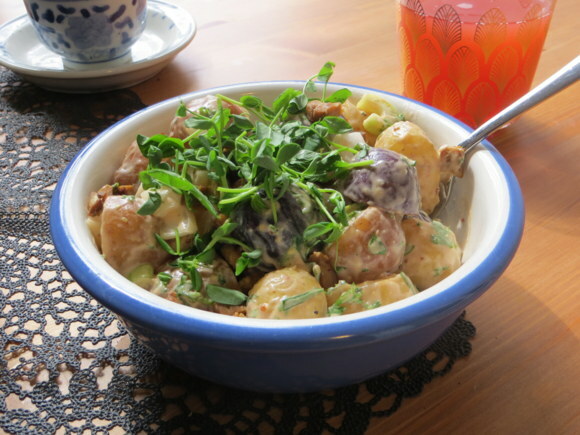 potato salad, I can’t trust that someone else hasn’t put pieces of boiled egg in it. Ew. So, when I found this recipe online last summer I knew it would be good. BBQ sauce is my condiment of choice and it is barely a fair fight. Although this dressing is mayo based it still feels light and delicious. It may not be a vegan adaptation of my mom’s recipe directly but it is the best version of something resembling hers I could ever want. This recipe is adapted from Food and Wine’s Potato Salad With Bacon and Barbecue Sauce. In a large pot of salted water, boil the potatoes until they are soft but still firm. About 20 minutes. While the potatoes are cooking, heat a small amount of oil in a frying pan over medium heat. Cook the tempeh bacon strips until they are golden brown on both sides, approximately 3 minutes per side. Remove the strips and place them on a plate with paper towel. When they have cooled, cut them up in to small pieces, the size of bacon bits. In a large bowl, big enough for the potatoes with room to mix, combine the mayo, barbecue sauce, mustard and vinegar. Toss the taters in the dressing while they are still warm but not hot. Let them sit in the dressing for about 20 minutes to cool and let the flavours to soak in. Add the celery, onion, parsley, tarragon and salt and pepper. Toss again and let sit for another 20 minutes. When you are ready to serve it, top with the tempeh bacon and the pea shoot leaves. Stay tuned soon for my take on the ultimate BBQ food, the burger!